New Door Ventures gives young people a way to get on track towards success. New Door uses innovative and evidence-based youth development strategies in our 14 week employment program. Youth participate as a member of a cohort, consisting of 15 – 20 interns. Young people learn with each other during their internships and support their peers. Paid internships: Every young person has a paid internship at one of our social enterprises or at an Ally partner site. Youth work 12 – 15 hours per week, taking on real responsibility, adding to the bottom line, and working alongside more experienced employees. Case management: All youth receive intensive individual support weekly from a highly trained case manager to accomplish their short and long term goals. Whether youth are trying to secure housing, get prescription glasses, or discuss their internship, these weekly check-ins help youth stay accountable while receiving assistance. 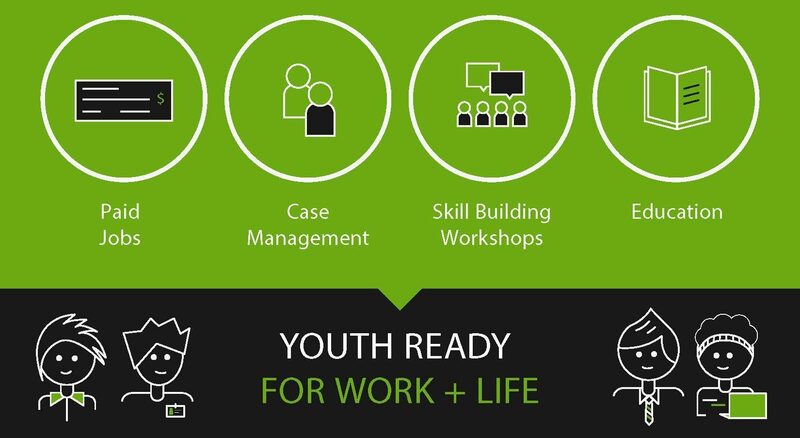 Skill building training: Youth learn techniques and tips to ensure success at work and in life. Every youth receives over 50 total hours of training, on topics that include communicating clearly and positively; providing professional customer service; writing a high-quality resume; and managing time & tasks effectively. Education support: In our modern economy, education is crucial to securing future employment. We offer personalized, incentivized classes for youth who need to earn their GED. We also provide one-on-one tutoring and individualized support to each youth, wherever they are on their education path. Learn more about how 16- 24 year olds can start working with us. We own and operate two businesses. Give a young person the chance to succeed by working with you.